IFAP is hosting a interpreter training at the law school on January 21, at 5:30pm. 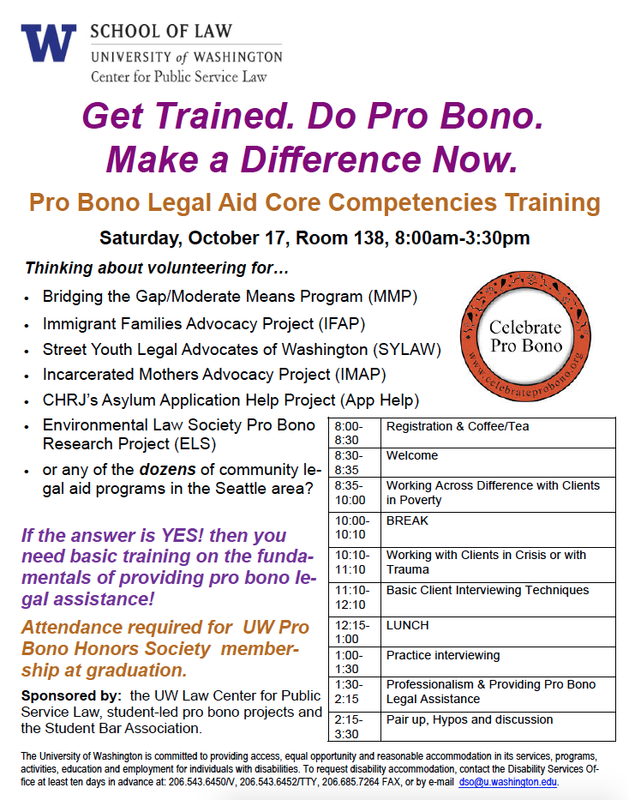 Martha Cohen, Program Manager of the Interpreter Program at King County Superior Court will be presenting on best practices for legal interpreting. Anyone interested in volunteering should e-mail IFAP interpreter liason, Steven McKevett at stevenmckevett@gmail.com so we can make sure there are enough snacks for everyone. Participation in IFAP is not required, but anyone interested in interpreting for our U-Visa clients should attend. IFAP interpreters provide essential interpretation and translation services to some of the most vulnerable members of our community. By assisting with the completion of U-Visa applications, IFAP interpreters help clients obtain work authorization and legal status in the United States. Interpreters work closely with a team of law students, a supervising attorney and a U-Visa applicant. In addition to interpreting for client meetings and phone calls, interpreters also translate birth certificates and other documents. Each case requires approximately 10 hours of interpreting and translating over the course of Winter and Spring Quarters. Interpreters must commit to at least one case and be available to interpret through the end of the school year. Are you an UW Law student interest in committing to an IFAP case for this year? Please see the following application. If you have any questions, please email ifappres@uw.edu. IFAP is looking for new 1L board members from the UW Law’s student body! Please see the attached position descriptions and applications. Contact ifappres@uw.edu if you have any questions.